The birds-of-paradise (Paradisaeidae) form one of the most prominent avian examples of sexual selection and show a complex biogeographical distribution. The family has accordingly been used as a case-study in several significant evolutionary and biogeographical syntheses. As a robust phylogeny of the birds-of-paradise has been lacking, these hypotheses have been tentative and difficult to assess. Here we present a well supported species phylogeny with divergence time estimates of the birds-of-paradise. We use this to assess if the rates of the evolution of sexually selected traits and speciation have been excessively high within the birds-of-paradise, as well as to re-interpret biogeographical patterns in the group. The phylogenetic results confirm some traditionally recognized relationships but also suggest novel ones. Furthermore, we find that species pairs are geographically more closely linked than previously assumed. The divergence time estimates suggest that speciation within the birds-of-paradise mainly took place during the Miocene and the Pliocene, and that several polygynous and morphologically homogeneous genera are several million years old. Diversification rates further suggest that the speciation rate within birds-of-paradise is comparable to that of the enitre core Corvoidea. The estimated ages of morphologically homogeneous and polygynous genera within the birds-of-paradise suggest that there is no need to postulate a particularly rapid evolution of sexually selected morphological traits. The calculated divergence rates further suggest that the speciation rate in birds-of-paradise has not been excessively high. Thus the idea that sexual selection could generate high speciation rates and rapid changes in sexual ornamentations is not supported by our birds-of-paradise data. Potentially, hybridization and long generation times in polygynous male birds-of-paradise have constrained morphological diversification and speciation, but external ecological factors on New Guinea may also have allowed the birds-of-paradise to develop and maintain magnificent male plumages. We further propose that the restricted but geographically complex distributions of birds-of-paradise species may be a consequence of the promiscuous breeding system. Birds-of-paradise (Paradisaeidae) are renowned for their complex courtships and diverse male plumages with highly elongated and elaborate feathers. Arguably, the birds-of-paradise form one of the most extravagant clades of all bird families in terms of beauty and display behaviour. The degree of sexual dimorphism found in the majority of species of birds-of-paradise (cryptically coloured females while males have spectacular ornamented plumages and elaborate courtship displays) is one of the most prominent avian examples of sexual selection. The birds-of-paradise also show complex biogeographical patterns, where most species and subspecies are locally and disjunctly distributed, sometimes in seemingly uniform and interconnected landscapes (summarized in ). Consequently, the family has been used as one of the earliest case-studies in significant evolutionary and biogeographical syntheses (e.g., [2–4]). Despite the evolutionary interest in the family, no comprehensive robust phylogeny of the birds-of-paradise exists. Several incongruent phylogenetic hypotheses have been proposed for the birds-of-paradise based on both morphology [5–8] and molecular distances [9–11]. The only molecular phylogenetic study  lacks several genera and is based only on a single mitochondrial marker. Recent molecular studies have demonstrated that some taxa, traditionally considered to belong to the birds-of-paradise, are more closely related to other passerine clades. Thus, Macgregor's bird-of-paradise (Macgregoria pulchra) is a giant honeyeater , while the cnemophiline birds-of-paradise form a distinct lineage well separated from the true birds-of-paradise clade [13–15]. The lesser melampitta (Melampitta lugubris) and the silktail (Lamprolia victoriae) have also been proposed to be related to the birds-of-paradise [10, 16, 17], but are now confidently placed outside this clade [14, 15, 18]. The Fisherian runaway model of sexual selection [19, 20] suggests that sexual selection could generate a rapid and continual change in sexual ornaments, as few males get most of the mating and are free from constraints imposed by parental behaviour. In lekking species, sexual selection and dimorphism are expected to be even stronger (e.g., [3, 21]. The power of sexual selection to drive changes in mate recognition traits is also potentially a potent force in speciation (e.g., [22–25]). However, some models suggest that strong sexual selection may act against speciation . Here we present a robust phylogenetic hypothesis and divergence time estimates for the birds-of-paradise (stricto sensu), based on both nuclear and mitochondrial sequence data. We use this i) to asses if the speciation rate and the evolution of sexually selected traits have been excessively high in the polygynous core birds-of-paradise, and ii) to examine biogeographical patterns and analyze the geographical differentiation in relation to sexually selected traits. We examined the phylogenetic relationship among birds-of-paradise by analyzing DNA sequence data from the mitochondrial cytochrome b gene and the two nuclear loci ornithine decarboxylase introns 6 to 7 (ODC), and glyceraldehyde-3-phosphodehydrogenase intron 11 (GAPDH). The taxon sampling includes all 40 species of birds-of-paradise recognized by Monroe and Sibley , omitting the genera Loboparadisea, Cnemophilus, Melampitta and Macgregoria, which have been shown to not be part of the birds-of-paradise clade [13–15]. The taxon sampling also includes Corvus cornix and Monarcha melanopsis, two taxa representing lineages that have been suggested to be closely related to the birds-of-paradise . 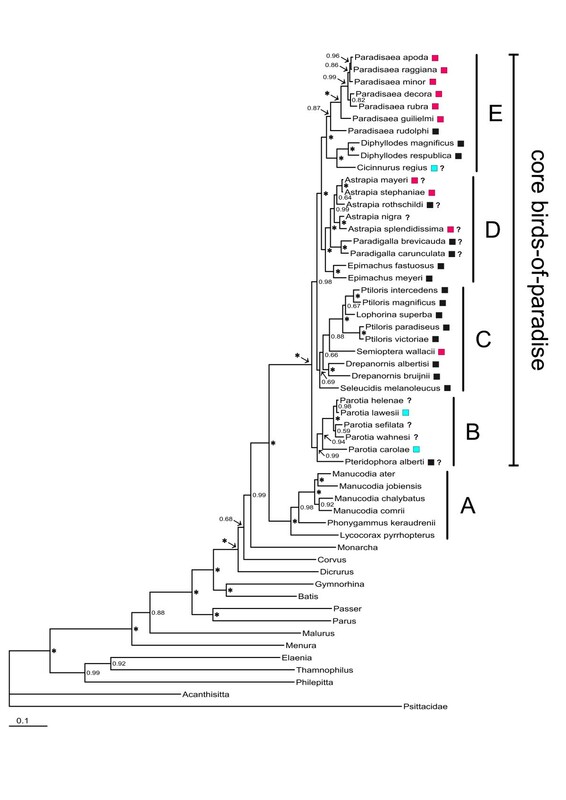 Three additional but more distantly related representatives of core Corvoidea as well as representatives from other major passerine lineages were also included. A representative from Psittacidae, the sister group to passerine birds, was used to root the trees. See Table 1 for the taxon sampling and GenBank accession numbers. Specimen data and Genbank accession numbers for samples used in the study. Acronyms: NRM = Swedish Museum of Natural History, Stockholm; ZMUC = Zoological Museum of the University of Copenhagen. All samples excect those marked with an asterisk are from vouchered specimens. For extractions, amplifications, and sequencing procedures from study skin samples we followed the procedures described in Irestedt et al. . Several new primers were also designed (Table 2). Primers designed for this study. The primers have been designed to amplify short regions (~200-300 bp) from degraded DNA obtained from museum study skin samples. We used Bayesian inference (see e.g., ) to estimate phylogenetic relationships. The models for nucleotide substitution used in the analyses were selected for each gene individually by applying the Akaike Information Criterion (AIC, Akaike ) using the program MrModeltest 2.2  in conjunction with PAUP* . Due to a rather low number of insertions in the non-coding nuclear loci the sequences could easily be aligned by eye. All gaps were treated as missing data in the analyses. Posterior probabilities of trees and parameters in the substitution models were approximated with MCMC and Metropolis coupling using the program MrBayes 3.1.1 . Analyses were performed for the cytochrome b gene, a concatenated data set of the nuclear loci (GAPDH and ODC), and a concatenated data set of all genes. In the analyses of the concatenated data sets the models selected for the individual gene partitions were used. We used an unconstrained, exponential branch length prior. All chains were run for 25 million generations, with trees sampled every 100 generations. The trees sampled during the burn-in (i.e., before the chain had reached its apparent target distribution) were discarded, and after checking for convergence, final inference was made from the concatenated output from the two runs. Sexual selection has been considered a driving force behind speciation [22–25]. By comparing speciation rates between clades with and without sexual selection it could be possible to investigate if sexual selection promotes speciation (e.g., [34–36]). The temporal variation in diversification rates is reflected by the variation in branch lengths in a chronogram and can be used to estimate the overall speciation rates as well as relative contribution of extinction . However, this requires taxonomically almost complete chronograms which is still lacking for the core Corvoidea. However, by using the methods described by Magallon and Sanderson  it is possible to estimate the diversification rate and the corresponding 95% confidence interval for the entire core Corvoidea, and compare this with the diversification rate of the polygynous birds-of-paradise. As the confidence interval will depend on the relative extinction rate (which is unknown) we calculated confidence intervals for both a high (ε = 0.90), and a zero (ε = 0) relative extinction rate. By using previously published phylogenies and divergence time estimates [39–41] it is possible to roughly estimate the divergence rates for Dicruridae and Monarchidae, two bird families closely related to the birds-of-paradise within the core Corvoidea assemblage. As the available divergence time estimates for these groups are based on other calibration points that suggest slightly different ages on comparable nodes, or only show relative age estimates, these estimates have been rescaled to be consistent with our chronogram. The rescaling was done by calculating the relative age between the two families, respectively, and the Corvus node (a node present in all trees) and multiply this age with our age estimate of the corresponding split. We consequently used the method to calculate diversification rates for crown groups . We used a relaxed clock model implemented in Beast 1.4.7 [42–44] to estimate divergence times between phylogenetic lineages based on the concatenated dataset of all genes. To calibrate the tree we used the geological split between New Zealand and Antarctica, as it has been associated with the basal separation of the Acanthisitta-lineage from all other passerines [45, 46]. The dating of this split has often been assumed to be around 85-82 Mya [47, 48], but more recently the timing of this split has been suggested to be more uncertain, 85-65 Mya [49, 50]. In order to account for this uncertainty we used a normal distributed tree prior with a median at 76 Mya and a standard deviation of 8 (quintiles 2.5% = 60.3 Mya, 5% = 62.8 Mya, 95% = 89,2 Mya, 97.5% = 91.7 Mya). As for other priors, we used all default settings, except for the Tree Prior category that was set to Yule Process and an uncorrelated lognormal distribution for the molecular clock model. We used a GTR+Γ model and ran MCMC chains for 25 million generations. For all taxa 841 bp of the cytochrome b gene was sequenced. As we used partially overlapping primers the region covers a 868 bp region (ending 125 bp from the 3' end in the cytochrome b gene). Taking into account that for some taxa a few short fragments are missing, the alignments of the non-coding intron regions are 387 bp for GAPDH (the individual sequences ranged between 247-269 bp), and 685 bp for ODC (ranging between 577-619 bp for all taxa, except Corvus that, due to a large deletion, is only 429 bp). Some indels in more variable regions were found to be autapomorphic, while most other indels are congruent with the phylogenetic tree obtained from the analysis of the combined data set. The only exceptions are a 4 bp deletion shared between all Paradisaea and Monarcha and a 1 bp insertion shared by the Parotia-Pteridophora clade and some outgroup taxa in the GAPDH locus. The prior selection of substitution models supported the GTR+I+Γ model for cytochrome b, the HKY+ Γ for GAPDH, and GTR+Γ for ODC. After discarding the burn-in phase the final inference was based on a total of 200 000-225 000 samples from the posterior for all conducted Bayesian analyses. For the phylogenetic inference of the concatenated data set of all genes, the mode of the posterior distribution of topologies is presented as a 50% majority-rule consensus tree (Figure 1). Phylogenetic relationships of the birds-of-paradise. The 50% majority rule consensus tree obtained from the analyses of the combined data set (cytochrome b, ornithine decarboxylase introns 6 and 7, and glyceraldehyde-3-phosphate dehydrogenase intron 11). Posterior probability values are indicated above the nodes, posterior probability values of 1.00 are indicated with an asterisk. Male display strategies in core birds-of-paradise according to (Frith and Behler 1998) are indicated by boxes to the right of the taxon names (red = lek, blue = exploded lek, black = solitary). Question marks to the right of the boxes indicate that display strategy is not fully established. The trees obtained from the analyses of cytochrome b and the nuclear data sets receive less support than the tree obtained from the analysis of the concatenated data set. Nevertheless, several clades are recognized in all analyses, and conflicts exclusively concern weakly supported nodes (posterior probabilities < 0.95). Most deviant in relation to the combined tree is the sister relationship between Epimachus and Drepanornis (pp = 0.83) suggested only by the cytochrome b tree. In the cytochrome b tree Monarcha is also nested between the Manucodia, Phonygammus and Lycocorax clade and core birds-of-paradise (pp = 0.90). Most nodes in our combined phylogeny receive strong support (pp > 0.95) and are often recovered by both the nuclear and the mitochondrial genes. Thus, we consider our combined phylogeny a reliable estimate of the evolutionary relationships among the birds-of-paradise. Five main clades are recognized in our phylogeny (A-E in Figure 1). The first clade (A) consists of manucodes (Manucodia and Phonygammus) and the paradise crow (Lycocorax pyrrhopterus). This clade is supported as the sister group to the core birds-of-paradise (remaining genera). The king of Saxony bird-of-paradise (Pteridophora alberti) and parotias (Parotia) form the second clade (B). Within this clade P. carolae is highly divergent and warrants separate generic treatment. The third clade (C) consists of the twelve-wired bird-of-paradise (Seleucidis melanoleuca), Drepanornis sicklebills, the standardwing bird-of-paradise (Semioptera wallacii), riflebirds (Ptiloris), and the superb bird-of-paradise (Lophorina superba). However, support for more basal nodes within this clade is low, and the affinity of the twelve-wired bird-of-paradise, Drepanornis sicklebills, and the standardwing bird-of-paradise should be regarded as provisional. Although support values are low, New Guinean Ptiloris and Lophorina form a clade separate from the Australian Ptiloris. This apparent relationship is worth investigating further as it suggests a significant phylogenetic break between Australia and New Guinea. The fourth clade (D) includes sicklebills (Epimachus), paradigallas (Paradigalla) and astrapias (Astrapia). The fifth clade (E), consists of Paradisaea birds-of-paradise, Wilson's bird-of-paradise (Diphyllodes respublica), magnificent bird-of-paradise (Diphyllodes magnificus), and king bird-of-paradise (Cicinnurus regius). Within this clade the genera Diphyllodes and Cicinnurus are sister lineages, while the blue bird-of-paradise (Paradisaea rudolphi) is sister to other Paradisaea birds-of-paradise. All nodes supported by posterior probabilities above 0.95 in the tree obtained from the Bayesian analyses of the concatenated data set of all genes (Figure 1) are recognized in the chronogram. The chronogram and divergence time estimates are shown in Figure 2. The split between the Manucodia/Lycocorax clade and core birds-of-paradise clade is estimated to have occurred around 24 million years ago, while the basal divergence of the polygynous core birds-of-paradise is suggested to be around 15 million years old. The age estimates further suggest that generic separations occurred between 6 and14 million years ago, while speciation within genera mostly occurred between 0.5 and 10 million years ago. Chronogram with divergence times estimates of the birds-of-paradise. The divergence times and confidence intervals (grey bars) were estimated under a relaxed clock model implemented in Beast 1.4.7 . For the calibration of the chronogram the postulated separation of Acanthisitta from all other passerines in the phylogeny was used. The calculated diversification rates and the 95% confidence intervals based on the mean diversification rate for the core Corvoidea at a relative extinction rates of ε = 0 and ε = 0.90 are shown in Table 3 (expressed as expected number of species). The results suggest that the speciation rates within the entire birds-of-paradise clade as well as within the restricted polygynous core birds-of-paradise fall within the 95% confidence intervals for the core Corvoidea at both low (ε = 0) and high (ε = 0.90) relative extinction rates. Absolute rate of diversification for the entire birds-of-paradise clade, core (polygynous) birds-of-paradise, some closely related families, and core Corvoidea, estimated in absence of extinction (ε = 0) and comparatively high (ε = 0.90) relative extinction rate. The 95% confidence intervals at relative extinction rates of ε = 0 and ε = 0.90 are expressed as expected number of species for each clade. The 95% confidence intervals have been calculated as described by Magallon and Sanderson [Magallon and Sanderson 2001] and is based mean diversification rate for the core Corvoidea (at a relative extinction rates of ε = 0 and ε = 0.90) and the age of the clades. Our divergence time estimates suggest that the birds-of-paradise originated approximately 24 million years ago, which renders the family older than previously suggested by DNA-DNA hybridization data  and allozyme data [9, 11]. Particularly noticeable is the old age (ca 15 My) of the sexually dimorphic and polygynous core birds-of-paradise. Although the variation in male plumage ornamentations is astonishing within the core birds-of-paradise (Figure 3), most of this variation is found between genera that diverged around 10 million years ago. More interesting is that morphologically homogeneous genera seem to be quite old. One of the most prominent examples is the genus Paradisaea. In this genus all lekking species are morphologically very homogeneous although the age of the genus is found to be more than 6 million years old (the split between P. guilielmi and other lekking Paradisaea species). Similarly, the morphological variation is modest within the genus Parotia, for which the exploded lekking system is estimated to be around 10 million years old. Other sexually dimorphic and polygynous genera such as Ptiloris and Astrapia also show little morphological diversification between species. The calculated diversification rates (Table 3) further indicate that the speciation rate in core birds-of-paradise is not excessively high. In fact the speciation rate seems to be more similar to the speciation rate found for the sexually monomorphic drongos (Dicruridae) than to the speciation rate found for the sexually dimorphic monarch flycatchers (Monarchidae). Examples of plumage diversity and sexual dimorphism in birds-of-paradise. Lower left male and female of the monogamous Manucodia keraudrenii, lower right male and two females of Parotia carolae, center left male and female Pteridophora alberti, top left male and female Paradisaea rubra, and top right male and female Diphyllodes magnificus. Christidis and Schodde  postulated that the evolution of spectacular variation in male plumages in birds-of-paradise could be explained by female sexual selection for novel partners (but see [52, 53]). This model was proposed to explain the apparent rapid radiation of the birds-of-paradise. However, in the present study we find no evidence that sexual selection has promoted a particularly rapid morphological diversification [19, 20] or an exceptionally high rate of speciation [22–25] in birds-of-paradise. Among passerine birds there is probably no other family with so many reported cases of interspecific and intergeneric hybrids in the wild as in the birds-of-paradise . For some genera where several species tend to have interconnected distributions, such as Paradisaea, gene flow through hybridization may have constrained speciation and phenotypic diversification. However, in most genera within core birds-of-paradise, species and subspecies are geographically well separated (i.e. Astrapia and Parotia), and modest speciation and phenotypic differentiation rates are thus difficult to explain by hybridization. Although little is known about the age when birds-of-paradise breed for the fist time, it is assumed that males of polygynous species do not reproduce until they have obtained full adult plumages, which happens several years later than in females . A longer generation time in polygynous male birds-of-paradise, compared to other passerine birds, may thus influence the inheritance rate of phenotypic characters in polygynous species of birds-of-paradise. Ecological factors, such as abundant food sources in New Guinea, may also explain that male birds-of-paradise have been able to develop and maintain promiscuous breeding, magnificent plumages and elaborate courtship displays. Birds-of-paradise are among the few bird groups that have developed a social system based on promiscuous mating and arenas or leks . It is therefore notable that our phylogeny suggests that the degree of lekking behaviour (from large communal lekking to solitary display) varies considerably within the polygynous core birds-of-paradise, showing no clear phylogenetic structure (Figure 1). It is also notable that the strong sexual dimorphism within core birds-of-paradise has been lost in the genus Paradigalla. Groups closely related to the birds-of-paradise, such as Monarchidae, Rhipiduridae and Dicruridae [41, 55–57] have all dispersed to other continents and remote oceanic islands. The birds-of-paradise on the other hand have only colonized islands within the New Guinea orogen, except two species (Lycocorax pyrrhopterus and Semioptera wallacii) inhabiting Halmahera and surrounding islands of the North Moluccas. The present distributions can largely be explained by vicariance, considering the fluctuating sea levels in the Late Miocene and Pliocene . This raises the question if the development of the special reproductive behaviour of birds-of-paradise may have constrained the capacity to disperse. In four genera of birds-of-paradise the sexes are morphologically similar: Manucodia, Phonygammus, Paradigalla and Lycocorax. These species are monogamous and form pair bonds, which is quite unlike the promiscuous behaviour of the rest of the family. This less "spectacular" life strategy probably enabled these birds to have a higher dispersal capacity and could explain the present day occurrence of Manucodia and Phonygammus on several islands off the New Guinea coast and on Australia's Cape York Peninsula, and of Lycocorax on the North Moluccas. Paradigalla on the other hand is a genus restricted to the central New Guinean mountain range, which renders it less likely to disperse. The present day distribution of Semioptera wallacii in the North Moluccas is more difficult to explain. However, molecular clock estimates (Figure 2) suggest that it diverged from other birds-of-paradise in the late Miocene at a time when these islands, which are of oceanic origin, drifted close by the Vogelkop peninsula [59, 60]. We propose that the main reason why the core birds-of-paradise, unlike other corvoid bird families, have only diversified within New Guinea and islands in the immediate vicinity is linked with their promiscuous breeding system. It is likely that the costs not only involve handicaps associated with ornamental plumes and intensive displaying, but also involve a strong attachment to display sites . Furthermore, the fact that males and females live separately, except during mating time, means that successful long-distance dispersal and establishment of new breeding populations are less likely. A similar sedentary life strategy, with limited dispersal outside mainland areas (and islands which have been connected with these areas) is evident in several other families with elaborate plumages, such as Phasianidae , Pipridae and the polygynous species within Cotingidae . Within several lineages of birds-of-paradise (Astrapia, Ptiloris and Paradigalla) there are distinct allopatric clades distributed in the east and the west of New Guinea, which separated about 3 - 6 million years ago (Figure 2). Allopatric speciation also appears to be the major mode of diversification within Paradisaea, which is a mainland lowland species complex that originated in the Pleistocene, while island species (P. rubra and P. decora) are slightly older. However, the divergences involving the mountain species (P. guilielmi and the highly divergent P. rudolphi) are much older. Within Ptiloris, the time separation of New Guinean and Australian taxa corresponds to broad land connections in the upper Miocene and marine transgression in the Pliocene . 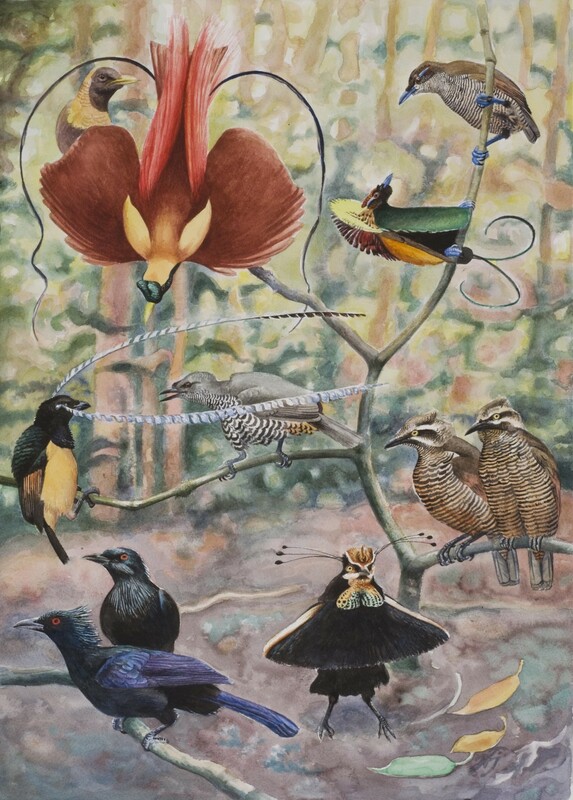 Heads [63–65] has argued that present day distributions of birds-of-paradise in New Guinea are difficult to explain simply by Pleistocene refugia processes, and rather that biogeographical patterns should be seen in light of historic terrane movements over a longer time span. As support for this hypothesis he used three birds-of-paradise genera (Astrapia, Parotia, and Paradisaea) for which assumed sister relationships suggest a strong biogeographical connection between the Vogelkop and the Huon Peninsula in western and eastern New Guinea, respectively. Our phylogeny does not provide support for this biogeographical scenario. A sister relationship between Parotia sefilata in the Vogelkop and Parotia wahnesi on the Huon Peninsula is only weakly supported (PP = 0.59), and within the genus Astrapia our phylogeny strongly suggests sister relationships between species that occur in closely connected geographical areas (between Huon Peninsula and the Central Highlands, and between the Vogelkop and the Star Mountains). Within the genus Paradisaea, P. guiliemi from the Huon Peninsula is sister to all other Paradisaea species (except P. rudolphi, a morphologically rather divergent montane species) occupying almost all lowland areas in New Guinea. The two species of Drepanornis as well as the two species of Epimachus separated about 10 and 7 million years ago, respectively. While the two species of Drepanornis occupy different elevations in low- and mid-montane forests, the two species of Epimachus are altitudinal replacements in mountain forests. Consequently, these two cases could represent old cases of altitudinal speciation. Parotia lawesii and Parotia helenae have similar patchy distributions as Epimachus across the mountains of New Guinea, and may represent a recent altitudinal speciation event. Examples of presumed altitudinal speciation in New Guinea have also been reported in Meliphagidae honeyeaters . The phylogenetic results suggest that the birds-of-paradise could be subdivided into five main clades (A-E in Figure 1). Some of these clades confirm traditionally recognized relationships while others are novel hypotheses. The divergence time estimates further suggest that birds-of-paradise constitute an older clade than previously suggested. It appears that diversification within several genera of birds-of-paradise has been a continuous process through the Tertiary and that younger divergences are geographically rather closely linked. In addition to allopatric speciation, there appear to be some examples of altitudinal speciation. Particularly interesting is the observation that sexually dimorphic polygynous genera are morphologically homogeneous although divergences between species are suggested to be several million years old, and that calculations of diversification rates indicate that the speciation rate is not excessively high. Thus, sexual selection in birds-of-paradise appears not to have generated a particularly rapid change in sexual ornamentations or a markedly high speciation rate. Although the explanation remains uncertain, a long generation time in polygynous male birds-of-paradise and extensive hybridization may have constrained morphological diversifications and speciation. External ecological factors, such as abundant food sources in New Guinea, may also explain why male birds of paradise have been able to develop and maintain promiscuous breeding systems, magnificent plumages and elaborate courtship displays. Foot pad samples were obtained from the Zoological Museum of Copenhagen (Jan Bolding Kristensen), the Swedish Museum of Natural History (Göran Frisk), and Australian Museum (Walter Boles). Jan Ohlson, Dario Zuccon, Love Dalén and three anonymous reviewers are thanked for comments on the manuscript. We also want to thank the staff at the Molecular Systematics Laboratory, Swedish Museum of Naturalhistory, for practical support. The laboratory work was funded by a grant to MI from Riksmusei vänner. MI designed the study, carried out the labwork, performed the phylogenetic analyses, and drafted the manuscript. 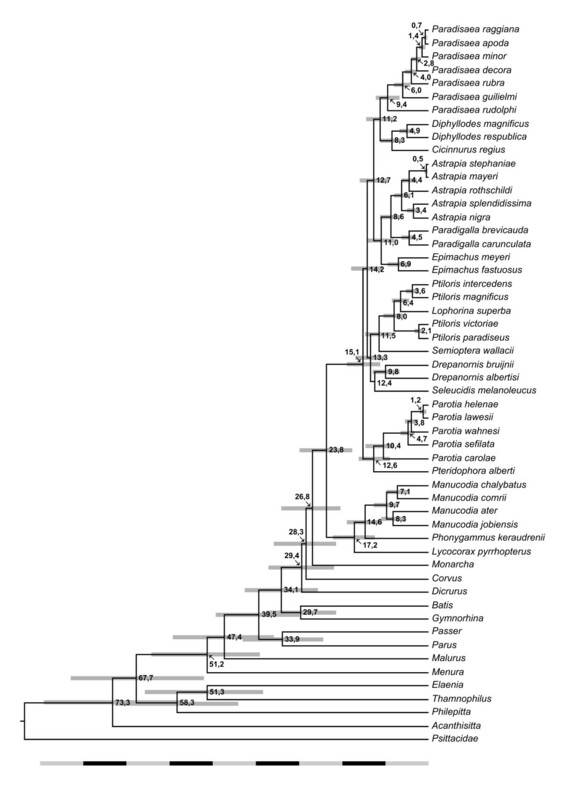 PE and KJ assisted with the phylogenetic analyses and conceived the study. JF, KJ and LC assisted with the design of the study and with the draft of the manuscript. All authors read and approved the manuscript.